In the Medieval the inhabitants of Okinawa lacking the possibility to possess any sort of weapon, started using tools and equipment destined for everyday use (mainly agricultural in their skirmishes with the Samurais. Thus, within a few hundred years the kobudo style - (fighting with weapons) arose and become an integral part of traditional karate. Its effectiveness was called upon by its creators when, unarmed, they had to fight Samurai, which on average could make four movements with their swords in a single second. 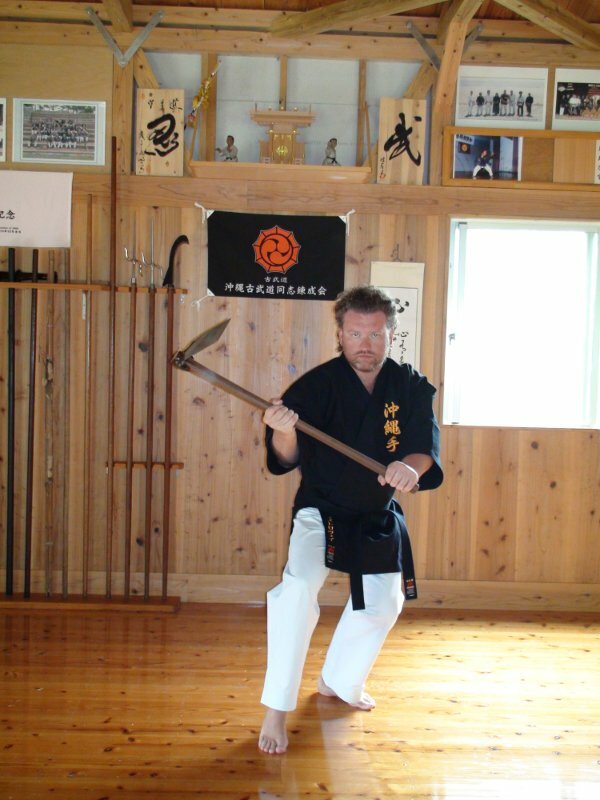 Five main instruments are used in Kobudo. They are: the Bo - pole, the Sai - blunt trident, the Nunchaku - small flail, the Tonfa - a mill-wheel handle, and the Kama-scythe. All these types of arms are an integral part of Okinawa Te, an entire classic Martial art in itself. The following weapons used to be employed; Eku - oars, Tekko - a type of brass-knuckles, Suratin - two small rocks joined by either a leather band or a metal chain, Tinbe - a turtle shell shield. However they presently do not to conform to modern Kobudo. A mill-wheel handle . It is made of very hard types of wood such as oak or cherry. Its average length is anywhere from 40 to 50 centimeters. The handle is fixed as a rule at a 90 degree angle, 15 cm from one of the ends. Two tonfas are usually used at the same time, one in each hand. It reinforces the karate master's upper arm, thus facilitating the possibility to repel attacks. The tonfa can inflict a great number of unexpected blows. It is presently used in a lot of countries as a police baton. Little flails used for threshing rice called nuchaka - (the translation of the Japanese character "noon" is "identical" or "double" and that of "chaka" - is segment), the most famous type of kobudo in the world, it is banned as an weapon in a lot of countries due to its deadly powers. Devised of two wooden cylinders 30 to 40 centimeters in length it is joined in the middle by a rope made of either silk or horse hair. Nunchakus are very effective for defense as well as for attack. There are three varieties: mid-length and long, which are used for harvesting the Papaya fruit and the short ,which is used in the collection of rice. In Kobudo all three types are used but it is the short kama, the most widely used, that has become a classical Kobudo weapon. Usually used in pairs, it has a Parrot-beak shaped blade which can be sharpened using the file located in the middle of the wooden handle. The blunt trident used for hoeing when planting rice, called sai, was developed as an arm in defense against swords. Made of steel, it weighs from 800 to 1200 grams and is 35 to 50 centimeters in length. It is widely used for both making blocks and attacks. It is generally used in pairs. The word "Roku" is Japanese means six, "shaku", stands for measurement approximately equal in length to one foot, and "bo" - is a wooden yoke used for carrying buckets. Fishermen then transformed them into a means for transporting boats through mangrove thickets. It is used in open fields. It makes it possible to defend oneself or to attack within a 360 degree circle. Fabricated from the shells of giant turtles living in the coastal waters around Okinawa. Originally used as a basket for carry vegetables or in the field as a sun-screen. In Kobudo it was transformed into a shield. Oars used for rowing or as a rudder. Its use is similar to the Bo, but the technique for using Eku differs from the Bo because the Eku has a different center of gravity. Two stones joined by either a metal wire or a leather cord. The former with a metal wire were used for mooring small boats in the port of Naha, and the latter were used to strengthen the moorings. They are used either as an offensive weapon or for making blocks. They are very effective in fights with adversaries armed with different types of steel weapons, such as the sword. With the aid of Surutin you can dislodge your adversary's sword or tangle it up in the metal wire. The metal wire or leather strip come in different lengths and they have an average weight of 400 rams. Used for easing the handling of horses harnessed to carriages. In Kobudo they are employed for inflicting blows or for blocking the impact of other weapons.